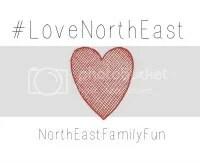 Rob and I are keen divers, and we wanted our children to share that love of water. I took James to swimming lessons when he was a baby, but stopped after a couple of terms. We’ve since taken him to Waves in Whitley Bay, which is a fab pool and is a bit like being on holiday! James sort of enjoys swimming, but he’s never been super thrilled about it. However, Noah is a total water baby. He burbles at the fish stickers on the wall next to the changing table, loves the aquarium, and thoroughly enjoys a bath. I don’t have a baby bath so he’s always had a deep bath to float in and he finds it very enjoyable. I’ve actually bathed him and he’s been asleep throughout! 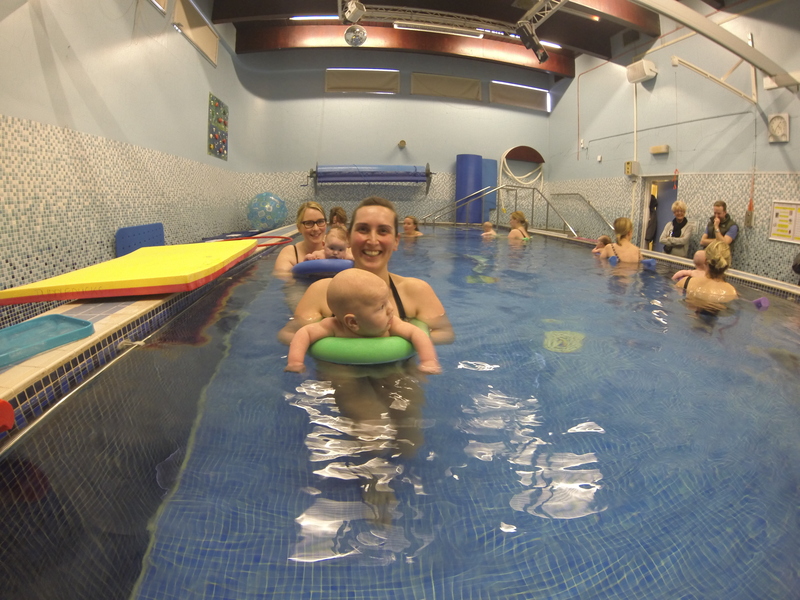 We got the opportunity to try swimming with Puddleducks Newcastle last week. 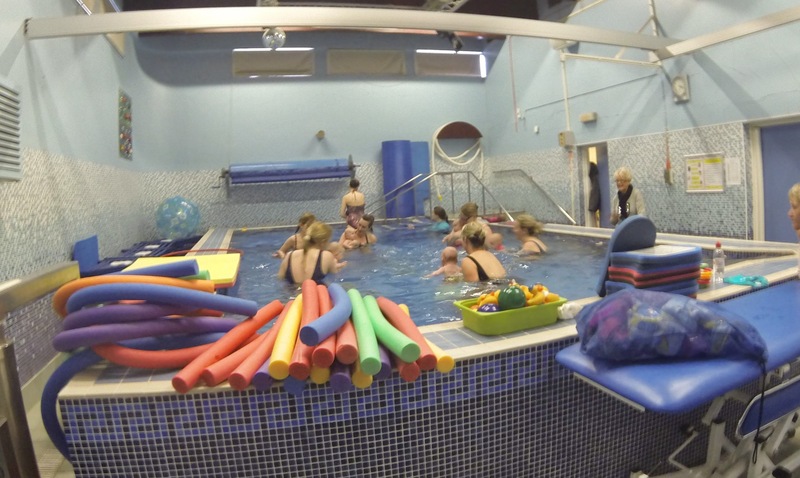 I went to their aquanatal sessions while I was pregnant with Noah, and found the lessons very relaxing yet energising. This pool is so lovely and warm! Noah was in the Floaties class. Our teacher, Caroline, was very welcoming and after showing me how to hold Noah safely in the water, she introduced me to the rest of the Floaties and their parents. We did lots of fun activities with the babies. We blew bubbles on the water, and you should’ve seen Noah’s face while I was doing that! We made the babies a ride on our “aeroplanes”, which I found very interesting because it’s a recommended activity in my Wonder Weeks app at the moment, due to Noah’s developmental stage – Smooth Transitions. Noah enjoyed swimming on woggles to start with, and he was very chilled out, but then he had pretty much had enough. Chasing a duck at Puddleducks! Half an hour is a long time when you’re three months old! The other babies went zooming under water, but Caroline gave me a bowl to pour water over Noah’s head. I have to say, I do that in our bath and he loves it, but I really think he was ready to get out, so he didn’t sound too impressed! At the end of the lesson, which is filled with singing and games, Caroline took each of the babies and held them safely at the side of the pool while the parents climbed out. Then the scramble to get babies dry and dressed while maintaining your dignity in a communal changing room! Then it was time for James’ lesson. He was in Little Dippers. As he’s not 100% toilet trained, James wore these rather dapper neoprene shorts. Again we did bubble blowing in the water, but this time all the toddlers did the bubbling, which would be a really important skill if they ever fell in water, and is of course part of learning to swim. Also important is being able to turn in water, and James was helped to do this by Caroline. We then began some back swimming, which you can see us having a go at here. James was concentrating very hard, and I was too, because I had to walk backwards without bashing into anyone! Trying to avoid causing a collision! When I took James swimming as a baby, the only thing the lessons really instilled in him was the ability to hold on to the edge of the pool. He is brilliant at this, although I must say it was more impressive when he was eight weeks old! So combining this skill with another of his favourite things – riding on my back – was a dream come true. Parents lined up in the pool facing inwards, and toddlers hung on the edge facing out, then giddy up cowboy! the toddlers turned around and jumped onto parents’ backs! We swam across the pool, turned around and they hopped off to cling to the side again. Brilliant fun. James smiled for the whole lesson. 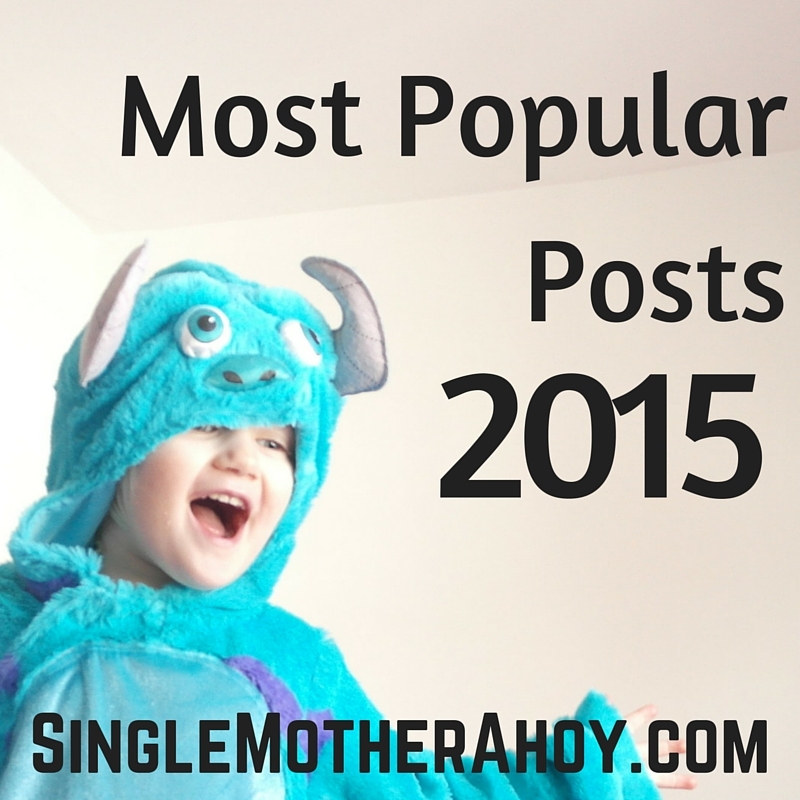 Seeing as how he’s never really loved swimming, I think the fun approach Puddleducks takes is definitely working! If it wasn’t so logistically mental to take two boys swimming, I’d be signing up to these lessons like a shot. Don’t worry how you’ll look in a swimming costume. You just made a tiny human! Something I am absolutely certain of is no-one is as interested in you as you are. Sad to say, everyone else there is thinking about themselves and their body and not judging you in the slightest. And you’re underwater all the time! No one can see you or your hairy legs! Consider wearing a dressing gown instead of a towel. 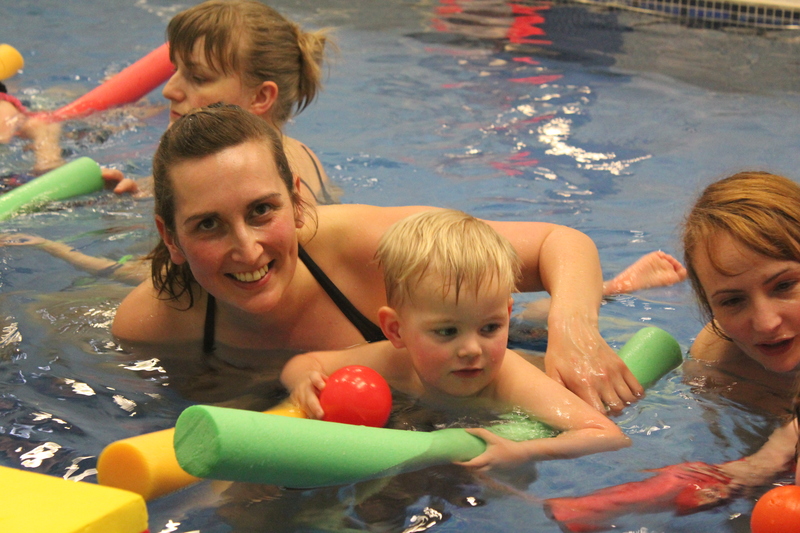 The thing about the majority of baby swimming lessons is that they’re in warm swimming pools, often in schools, and usually with communal changing rooms. You need to get a baby dressed, and you will manage more easily if you don’t have to keep wrapping a towel around you! For more top tips, read the Puddleducks website. Aw what cute pics, did you use a go pro? Waves looks like a great place for little ones, might have to take my niece and nephew there! I did use a go pro, but I had the worlds most reluctant photographer (Rob) so didn’t get many cute shots! Waves is fab, there’s a pirate ship with two slides next to a shallow pool, and the bigger pool has a wave machine next to some huge floor to ceiling slides. Really good. There is a soft play for afterwards too! 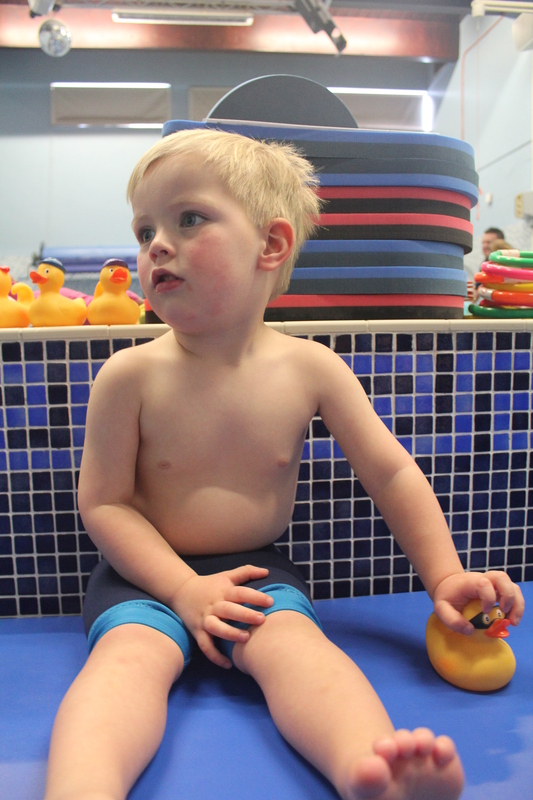 I swim with my little one at Puddleducks too and have blogged about it a bit (though not specifically about what we do in class, more about the trials and tribulations of getting there and changed). I love it though. I’m not a great swimmer myself so I really wanted Piglet to start as young as possible so that he’s used to the water. Getting there and getting changed are huge deals! I love baby swimming, it is really important to get babies used to water, you’re right.